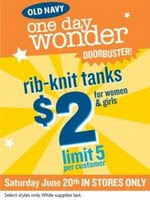 Reminder- $2 tanks at Old Navy today! They will have 50 different styles and colors available! You’ll get to choose between solid, stripe, print and/or embellished! Limit 5 per customer. Our Old Navy opens at 9:30am.